Emerging talents, outstanding customer service and industry commitment will all be recognised, courtesy of four separate, highly valued awards that candidates can be nominated for. Members of the Guild of Architectural Ironmongers (GAI) or the IAI can nominate an IAI member using an online form. The deadline for entries is 23 November. The above image shows, from left to right, Teresa McQuay, Samantha Thatcher, Amanda Haley and Maria Powell (on behalf of Sarah Lewis). The IAI Fellowship Award is given to an individual who has shown a longstanding and ongoing commitment to the IAI over at least 10 years, and who is still actively involved within the industry and Institute. Teresa McQuay, managing director at JEB Supplies, was last year’s recipient. 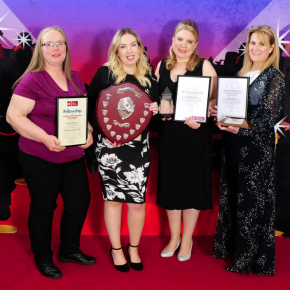 The Paul Lewis Award for Customer Service is given to an individual, group or company that has made an outstanding commitment to customer services throughout the year. Last year’s award, sponsored by Royde & Tucker, went to Sarah Lewis, specification manager at Lorient. The GAI Award for Services to the Institute is always awarded to a current IAI member who has made a recent and visible contribution at branch level. The 2018 award went to Amanda Haley, technical and marketing director at Ian Firth Hardware. The Promising Ironmonger of the Year Award is intended to recognise the brightest ironmongers in the early stages of their careers. They could be involved in scheduling, estimating, sales or a combination of them all. Last year’s winner was Samantha Thatcher, office and marketing manager at SDS London. Jo Milne-Rowe, chair of the IAI, commented: “The IAI awards is all about celebrating the outstanding individuals we have in our industry and using their experiences to inspire the next generation of ironmongers.